Some very kind people are making regular payments to sponsor animals at the Black Sheep Animal Sanctuary. 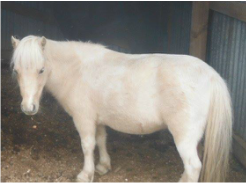 Our animal sponsorship scheme enables us to help more animals. Thank you so much to all the wonderful sponsors out there - your help make our work possible! 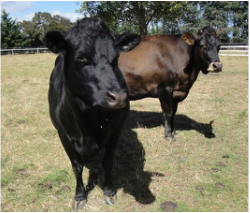 Hazel is a young cow who would have gone into the dairy industry but is now living a happy life with her cow friends at the Black Sheep! 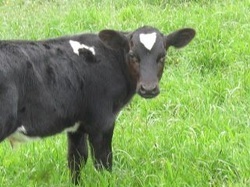 Unlike most dairy cows, she will not be made pregnant every year, and her calves slaughtered. She has grown into a big friendly girl and she loves licking any passing humans! In winter 2016 a very kind couple discovered an abandoned lamb. Bo was born next to a farm fence, but as a newborn she fell through and was too weak to get back in through the fence to her mother's side. The couple took her in, and lovingly cared for her. However, as they didn’t have enough space to keep her permanently, they got in touch with the Black Sheep and she moved in. Everyone at the sanctuary has fallen in love with her! Softie is a beautiful 'Silky' rooster. 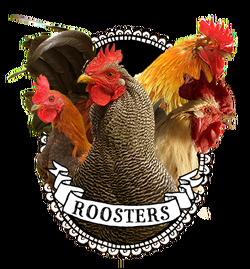 Roosters always have a hard time finding safe homes - as they crow and don't lay eggs, few people want them. 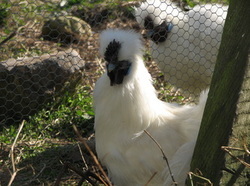 So we were very glad to be able to offer Softie and his brother silkies a refuge at the sanctuary. 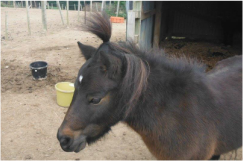 In early 2016 Chester (along with his friend Lilly) arrived at the sanctuary - a miniature horse who had been rescued by a kind family who nursed him back to health, but who now needed another home. He and Thunder have become great friends. Like Thunder he suffers from laminitis, but with a new run system and careful diet he is well and happy. Moby came to us in the winter of 2015 at the age of about five, after his caregivers went overseas. Soon he seemed very much at home! He has a gorgeous gingery head and likes to have his head stroked. He is very sweet and mild-mannered. 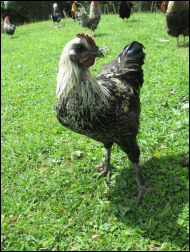 Georgie Boy was one of the very first roosters to arrive at the sanctuary. He is getting quite old now and usually looks a wee bit unkempt as he is a frizzle breed, and his age also shows in his feathers. Although he is blind in one eye, he can hold his own in the flock and has got more and more friendly towards humans over the years. He loves following people around! Mabel arrived in spring 2015, along with a small flock of ex-battery hens who narrowly escaped slaughter. When she first moved in, she could barely stand. We gave her some homegrown physical therapy - just picking her up and putting her on her feet, time and time again. Soon she got the idea, and within three days she had learned to walk. Toa arrived at the sanctuary, as a tiny, frightened wild piglet. Quickly she realised that humans were friends and playmates, and learned to trust us. She has also formed strong bonds with the older, larger pigs at the Black Sheep, and particularly enjoys playing in the paddock with the other pigs and goats! 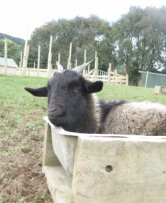 Our beautiful Carla is a young sheep with deep brown wool - she is shy but lovely. 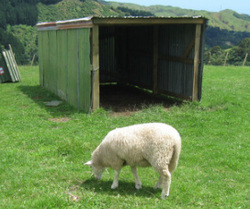 She arrived at the sanctuary as one of a group of lambs who had been raised for slaughter, but were thankfully rescued. 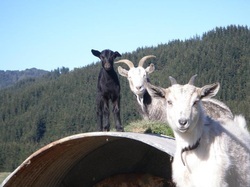 Their original rescuer was unable to look after them all, so we gave Carla and her friends a home at the Black Sheep! 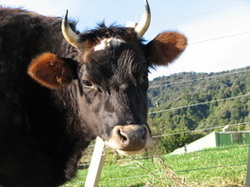 Poppy came to us as a young cow who would have gone into the dairy industry. 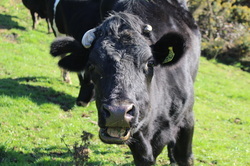 Luckily she was rescued, and is now living a happy life with the other cows at the Black Sheep Animal Sanctuary. We're so glad that she will not be made pregnant and her calves taken away from her! Our lovely Bartholomew (left) really is a beautiful boy. 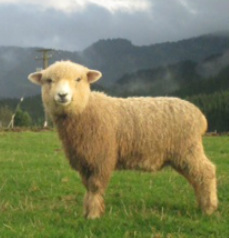 His original rescuer could no longer look after him, so we gave him a home at the Black Sheep! Here he is enjoying the green grass of last spring. Dave is a very friendly rooster who loves showing off! 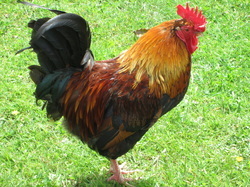 Like so many roosters he was unwanted because he doesn't lay eggs and greets each morning in a very loud voice! 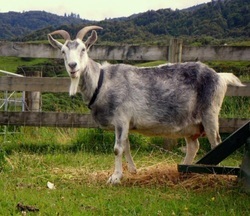 He has settled in well at the sanctuary. 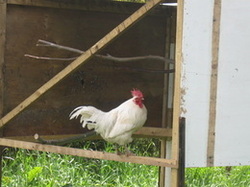 Julius was one of the first roosters to arrive at the sanctuary. 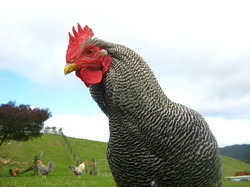 He is a lovely big white boy, and has long reigned as one of the dominant roosters in the rooster park in the orchard! He is very confident and friendly. Sponsored by: Sheree, SAFE, Andrea and Simon! 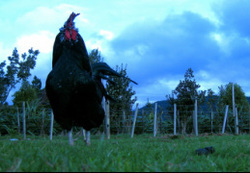 The Black Sheep cares for around 50 roosters, who would otherwise have been killed or abandoned. Vast numbers of roosters are slaughtered as they crow and do not lay eggs. Support from generous sponsors helps these beautiful boys live in safety. Steve is a large handsome speckled rooster, and one of the first residents to move into the Black Sheep Animal Sanctuary. 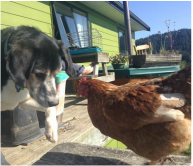 Formerly on death row because of his loud crow, he now lives with the roosters in the rooster orchard. Sunday is a very cute and loved little black goat, who needed a new home - luckily we were able to offer her a place at the Black Sheep. She is full of high spirits and mischief, and very playful. Sometimes she likes to escape into the pig paddock, where she gets covered in mud! So glad our naughty charmer is with us! Luna is a another splendid rooster who sadly was homeless and unwanted. Luna came here because his humans had bought 5 eggs hoping for hens and a bunch of them were male and Luna was the only one they couldn't find a home for else where. He now enjoys life with the other roosters at the Black Sheep, and always emerges with enthusiasm at feeding time! 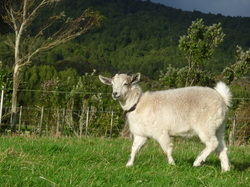 Kale is one of the few residents to have been born at the Black Sheep. His mother was a rescued ewe who was already pregnant when she arrived at the sanctuary, and Kale was born in a stormy spell during September. He still has a close bond with his mum. 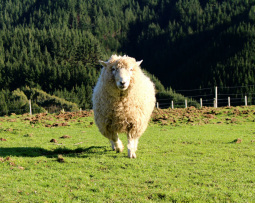 Unlike most sheep on farms, Kale has not been docked, and enjoys having a tail! Our beautiful boy Dhanna is one of so many homeless roosters - unwanted because they crow loudly and don't lay eggs - Dhanna has had an eventful past. He spent some time at a monastry, but there wasn't really a place for him, so he was lucky to join the other boys at the Black Sheep, where he hangs out in the rooster orchard. His eyes are a bit squinty but he has a great personality! Jacob was rescued along with 9 other lambs, due for slaughter. Jacob follows Bartholomew (his best friend) around everywhere and is a very shy sheep though deep down he secretly loves cuddles. He has a funky mop of hair and rocks the teddy bear look. 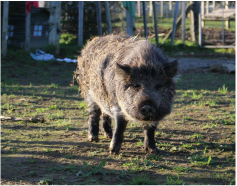 Lola came to the sanctuary as a young piglet with behavioural issues - she had been rescued as a runt, but had trouble getting on with humans and other pigs as she lacked sufficient contact as a bably with pig friends and siblings. 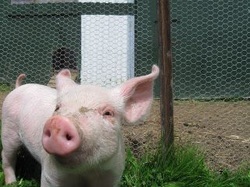 She has now learned to get on with the other pigs and has settled in well to the sanctuary. Struan is a rather splendid and much loved cow who desperately needed a new home. Fortunately she found a safe space at the Black Sheep, and has made friends with the other cows. 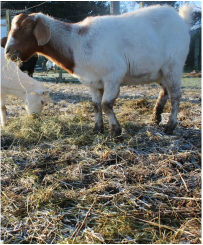 Blossom is a very beautiful and playful little white goat who arrived at the Black Sheep a couple of years ago, as she had nowhere else to go. She has bonded well with the other goats, and enjoys the specially constructed goat playground. 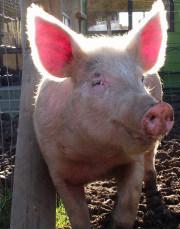 Horace and his sister Dorris were rescued from a factory farm towards the end of 2011. Both have settled wonderfully into the sanctuary, and are very playful and inquisitive with tremendous energy. 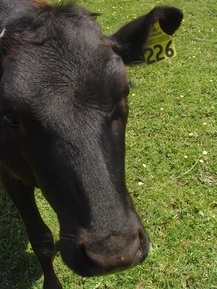 Sirius is a beautiful gentle bobby calf who was due to go to the freezing works, but was thankfully saved in time, and found a safe home at the Black Sheep. He is hard to photograph as he like to stand right next to you and lick you. Stanley is now sponsored by Kirsty! And Hetty is sponsored by Rachel! Stanley and Hetty's owners could no longer look after them, and there was nowhere for them to go until they found a safe space at the Black Sheep. They are both friendly and love a good rub and lots of attention! 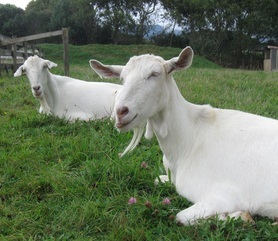 Dorris (shown here with her brother Horace) was rescued from a factory farm in October 2011. Like her brother she is very playful and curious about her environment. Both are growing fast and love their food! 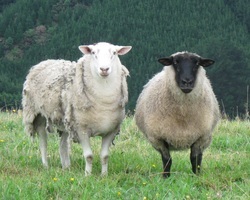 Hector the ram (seen here with his friend Ethel) would have gone to the slaughterhouse but for finding a safe haven at the Black Sheep. Iris lives at the Black Sheep with Hazel, Poppy and Lily. Like them she nearly went into the dairy industry but is now living a happy life with her cow friends and Thunder the miniature pony at the Black Sheep! 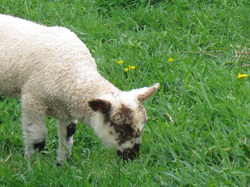 Ethel the black-faced sheep was already pregnant when she arrived at the sanctuary. Early in spring she gave both to a sweet spotty-faced lamb - even his little legs are spotty! Fennel and his mum are both thriving.